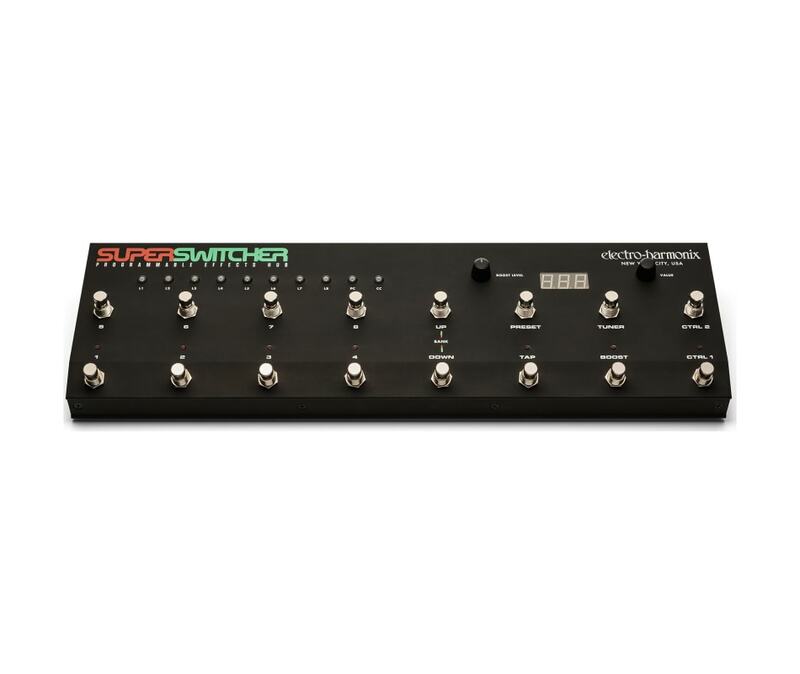 The Super Switcher, as its name implies, offers a powerful solution for players who are tired of tap dancing around their pedalboard. In effect, it moves all of your pedals to your pedalboards front row while delivering control of them with one button push. The result is that it puts the player back in control of an unruly pedalboard! Its also perfect for any guitarist using the four-cable method because it makes it easy to properly route effects that should go in front of an amp and those that are best in the effects loop. When it comes to live performance, the Super Switcher can efficiently organize presets into banks that are easy to recall and match your shows set list. If youre playing to a click track and want to have the presets recalled via MIDI programmed to a song, the Super Switcher can handle that, too. Its also a great way to sync time-based effects to the same master clock. - Boost footswitch engages a knob adjustable, output gain Boost on both the left and right channels. - Equipped with tuner and tap tempo outs, MIDI In & Out and more. - Extensive I/O maximizes flexibility and control. - Features eight mechanical-relay controlled, true bypass loops. - Provides 128 presets: 16 banks with 8 presets each. - Tap footswitch sets the BPM. The Super Switcher can be configured to send/receive MIDI clock and send tap signals to the output. BPM can be global or per preset. - Tuner footswitch sends the input signal to the tuner out and cuts off the signal from any loops or output.